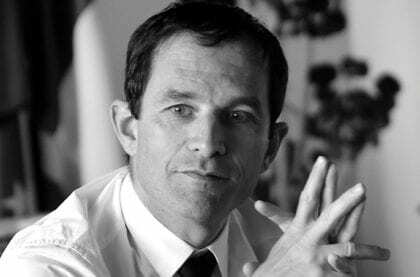 Benoît Hamon, member of the French National Assembly for Yvelines, is making unconditional basic income a key component of his Socialist Party (PS) primary campaign. Though all of the Green candidates have showed support for basic income, Hamon is the only PS candidate to express vigorous support for the idea. Relatedly, Hamon campaigns for the recognition of “burnout” as an occupational disease. “The Law on social dialogue and employment” first recognized burnout in this way last year, and Hamon would like to make further advancements. Moreover, today in France, 24% of individuals between the ages of 15 and 24 are unemployed. “The youth… should no longer be synonymous with insecurity,” writes Hamon. Here are the main features of the UBI program that Hamon proposes. Hamon plans to finance the basic income in part through reforms to the tax system, expecting to bring in €24 billion in revenue by individualizing income tax, €84 billion by closing tax loopholes, and €80 billion by fighting against tax evasion. He also recommends taxing wealth and digital technology, in addition to other appropriate taxation (he provides the example of French tax authorities who are currently demanding €1.6 billion in back taxes from Google). Le revenu universel, la voie pour le progrès socialLe #RevenuUniversel pose la question fondamentale de la société que nous voulons pour demain. Pour aborder l’avenir avec confiance, notre pays a besoin d’un projet mobilisateur en ce début de XXIe siècle. Ayons l’audace de créer le revenu universel, comme nous avons eu l’audace de créer la sécurité sociale, pour protéger chaque citoyen face aux aléas de la vie. Hamon wants to change conceptions of wealth, the value of individuals, and the value of work from economic (GDP) to social, cultural, and educational. He explains his vision in the above video. September polls show Hamon with support from 14% and 16% of those who intend to vote in the election. The PS presidential primary will take place on January 22, 2017. On October 18th, Hamon invited people to a well-attended Q&A over coffee and drinks. 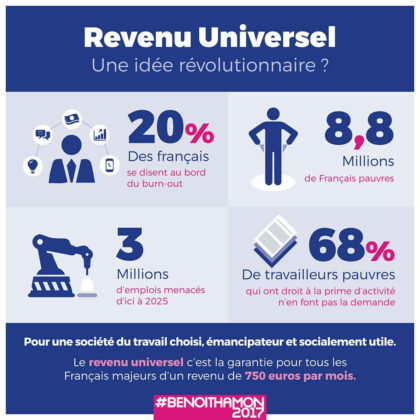 Hamon’s campaign is part of a growing surge of interest in UBI in France. France’s prime minister, for instance, recently reopened the gates for discussion on basic income. Cover Photo: by Margot L’hermite, published on Facebook on Oct 25, 2013. Graphic: by BenoitHamon2017, campaign flyer. Video: by Benoit Hamon, published on Facebook on Oct 4, 2016. Nick Yeretsian has written 7 articles. Nick is an active environmentalist, effective altruist, and artist. Nevertheless, he attempts to remain unbiased and impartial. Here are some of his favorite websites: ecosia.org, givewell.org, nutritionfacts.org. The median equivalent adult income in france is 24.5k/year. The 60% at risk poverty level of 24.5k/year is 14.7k/year or 1225/month. The 50% poverty level of 24.5K/year is 12.25k/year or 1000/mo. With a basic income of 750/month, that would amount to letting the poor live in poverty and increasing taxes for everyone including the poor and especially the wealthy. Comparing basic income with the poverty level as defined by 60% of median income is misguided because median income is (usually) calculated per household. Since basic income is individual, the more people in the household, the more UBI you receive. So in effect, most poor households would receive much more than the median income as a result. This is not true for single person households, for whom you need complementary benefits, especially housing benefit. Thank you for the observation, however this* is, indeed, an individual income, not household income. If you know of a better source of individual incomes, please let me know, but this should suffice.